(CAMBRIDGE, Mass.) – A team of scientists at the Harvard John A. Paulson School of Engineering and Applied Sciences (SEAS) and the Wyss Institute for Biologically Inspired Engineering at Harvard University has extended their microscale 3D printing technology to the fourth dimension: time. 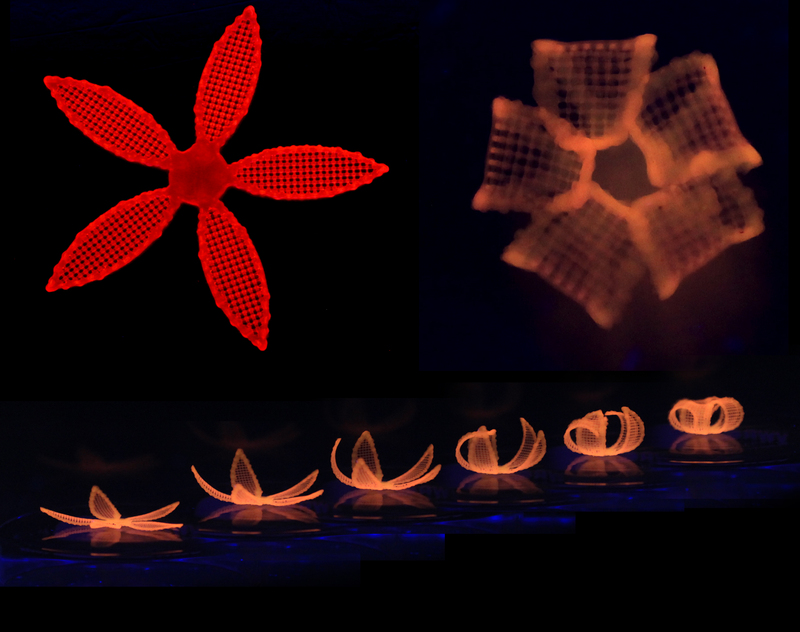 Inspired by natural structures like plants, which change their form over time according to environmental stimuli, the team has unveiled 4D-printed hydrogel composite structures that change shape upon immersion in water. Lewis is the Hansjörg Wyss Professor of Biologically Inspired Engineering at SEAS and a Core Faculty member at the Wyss Institute. L. Mahadevan, the Lola England de Valpine Professor of Applied Mathematics, Professor of Organismic and Evolutionary Biology, and Professor of Physics at Harvard, as well as a Wyss Core Faculty member, is a co-author on the study. Their team also includes co-author, Ralph Nuzzo, the G.L. Clark Professor of Chemistry at the University of Illinois at Urbana-Champaign. In nature, flowers and plants have tissue composition and microstructures that result in dynamic morphologies that change according to their environments. 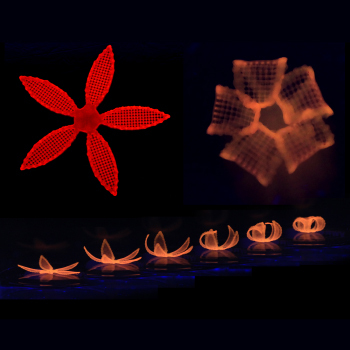 Mimicking the variety of shape changes that plant organs such as tendrils, leaves, and flowers undergo in response to environmental stimuli such as humidity and/or temperature, the 4D-printed hydrogel composites developed by Lewis and her team are programmed to contain precise, localized swelling behaviors. The hydrogel composites contain cellulose fibrils that are derived from wood and are similar to the microstructures that enable shape changes in plants. Reported today in Nature Materials, the 4D printing advance combines materials science and mathematics. The study’s co-lead authors are A. Sydney Gladman, a graduate research assistant advised by Lewis, specializing in the printing of polymers and composites; and Elisabetta Matsumoto, a postdoctoral fellow advised by Mahadevan, specializing in condensed matter and material physics. By aligning cellulose fibrils during printing, the hydrogel composite ink is encoded with anisotropic swelling and stiffness, which can be patterned to produce intricate shape changes. The anisotropic nature of the cellulose fibrils gives rise to varied directional properties that can be predicted and controlled. Like wood, which can be split more easily along the grain than across it, the hydrogel-cellulose fibril ink undergoes differential swelling behavior along and orthogonal to the printing path when immersed in water. Combined with a proprietary mathematical model developed by the team that predicts how a 4D object must be printed to achieve prescribed transformable shapes, the method opens up potential applications for 4D printing including smart textiles, soft electronics, biomedical devices, and tissue engineering.